It's official! 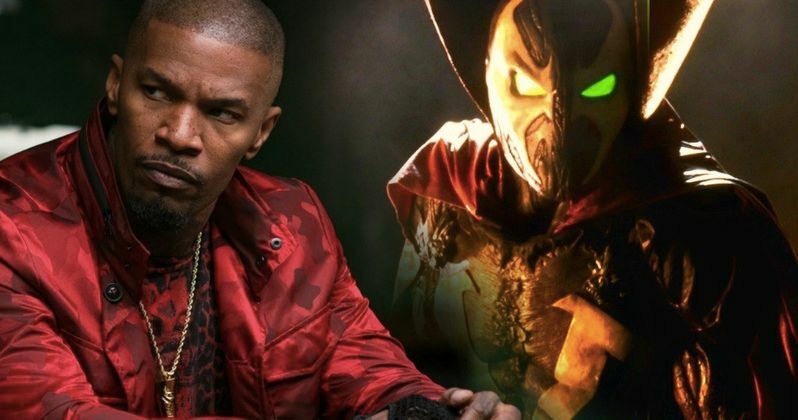 Jamie Foxx is our new Spawn. The Oscar-winner has boarded the upcoming comic book adaptation from Blumhouse Productions, which will see the character's creator, Todd McFarlane, making his directorial debut, working from a script he wrote. Foxx expressed interest in the role of Al Simmons, aka Spawn in the past and we recently reported that he may indeed be circling the new live-action take on the Image Comics character. Now he's locked in and will be taking on his first role in a comic book movie since 2014's The Amazing Spider-Man 2. Here's what Foxx had to say about it in a statement. "A few years back I flew out to Arizona to meet the man behind one of the most incredible comic book characters in the universe... Todd McFarlane. He was taken aback when I told him with the enthusiasm of a young child that more than anything I wanted to put my name in the hat to embody his beloved character Spawn.... I told him no one would work harder than me if given the opportunity... well... the opportunity is here!! I'm humbled and ready to transform... and to top things off the young Jason Blum is lending his brilliance to the project! Time to be great!!!! #Spawn." Blumhouse, the studio responsible for such franchises as The Purge, Paranormal Activity and Insidious, is known for their low-budget approach to filmmaking. The studio cut a deal with Todd McFarlane last summer to produce the movie, which hopes to atone for the sins of the 1997 take on Spawn. This new R-rated Spawn isn't going to be a Marvel blockbuster and will cost anywhere between $10 and $12 million to produce, making it a unique movie within the genre. Jason Blum, head of Blumhouse, had this to say about the casting. "We are thrilled Jamie Foxx will be playing the title role in our movie adaptation of Spawn. He is an incredible actor and a huge fan of the Spawn Universe that Todd McFarlane created. With the depth of talent Jamie can commit to the role and Todd at the helm bringing the world of Spawn to life, we could not be more excited for this film." Todd McFarlane has made it clear in the past that Spawn won't actually be saying much in the movie and won't even be the lead. The character Twitch from the comics, who has yet to be cast, is going to have that honor. So how is it that McFarlane and Blumhouse managed to convince an actor like Jamie Foxx who won an Oscar for his work in Ray to take on something of this nature? Here's what McFarlane had to say. "There are five or six moments where I'm going to need things from my actors, and a couple of them have to come from Jamie, and I've seen him deliver them onscreen. He gets into a zone, with body language and a look that basically will say way more than anything I could type on a piece of paper, and this movie is going to need those moments. And in the odd moment where he has to deliver a line that's short, curt and has impact, he can do it in a way that makes you go, 'Whoa, I don't want to mess with that guy. What a badass.' Jamie came to my office five years ago, and he had an idea about Spawn and we talked about it. I never forgot him, and when I was writing this script, you sort of plug people in, and he was my visual guy and I never let go of him. When I got done and my agents and everybody was talking about what actor, I said, I'm going to Jamie first and until he says no I don't want to think about anyone else because I've never had anyone else in my head. Luckily, he hadn't forgotten either. I said, 'Hey, I'm back to talk about Spawn again, and he was like, let's do it.'" In the past, Todd McFarlane has compared the movie and the character of Spawn to Jaws. He is going to be a terrifying presence lurking in the background. McFarlane also says that this movie won't be an origin story and that the success of A Quiet Place has helped this project out in a way. As with many comic book movies, he also says there is a trilogy in mind, assuming this first movie does well. "The scariest movies, from Jaws to John Carpenter's The Thing, or The Grudge and The Ring, the boogeyman doesn't talk. It confuses people because of the comic book industry, and because they all default into their Captain America mindset and I keep saying, no, get into John Carpenter's mindset or Hitchcock. This is not a man in a rubber suit, it's not a hero that's going to come and save the damsel. It's none of that. At the end of the movie, I'm hoping that the audience will say either, is this a ghost that turns into a man, or is it a man that turns into a ghost? I've got a trilogy in mind here, and I'm not inclined in this first movie to do an origin story. I'm mentally exhausted from origin stories. Luckily, there's a movie that just came out that helps my cause. In A Quiet Place, the first thing on screen is a card in black and white letters that says Day 89. It doesn't care about what happened in those first 88 days. There are a couple headlines, but then we are on day 450. That movie doesn't worry about explaining and giving all the answers. What it said in that case was, if you can hang on for a story of survival of this family, this movie will make complete sense for you." Currently, there is no release date set for Spawn, but the movie is expected to go into production this year. With a trilogy possibly being planned, and Blumhouse loves turning their successful movies into franchises, Jamie Foxx could be looking at a long-term deal to play the character on the big screen. We'll be sure to keep you up to date as more details on the project are made available. This news comes to us courtesy of Deadline.